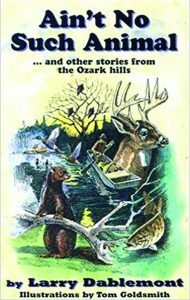 AIN’T NO SUCH ANIMAL and other stories from the Ozark hills, by Larry Dablemont; illustrations by Tom Goldsmith. Published by Lightnin’ Ridge Books, Box 22, Dept. TGM, Bolivar, MO 65613. Price: $15.95, plus postage. This 252-page softbound volume features a brief word from the author, no index, a score of humorous stories, a few black-and-white photographs, and a great number of good sketches by Tom Goldsmith, usually on the title page or final page of each chapter. Most of the stories are less than 20 pages in length and several can be read at a setting. This is an enjoyable book to read. It is not technical, there are no specs, the hunts are not always successful, nor the fish the largest caught that day, but then such is life. It is a book which can be picked up, a couple of stories read, laid back down to be enjoyed again later.